In this segment of With a Terrible Fate, I analyze the structure of Termina’s sidequests, and postulate reasons why these sidequests are fundamentally different from those of many other games. 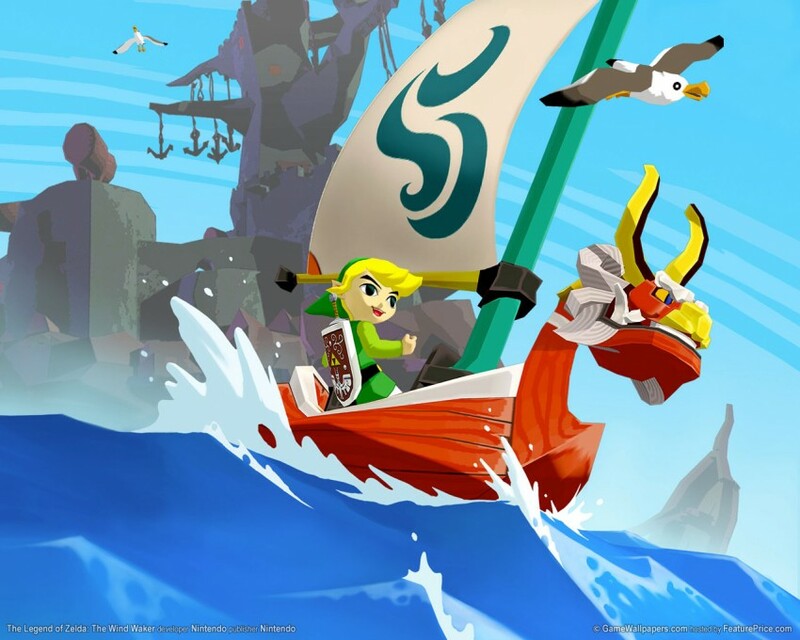 You might say comparing collection sidequests to “Majora’s Mask” is lopsided in the first place, so here is what many (myself included) would consider a better type of sidequest: that is, the sidequest design of “Legend of Zelda: The Wind Waker” (a game that also happens to be a favorite of mine). The events of “Wind Waker” take place on the Great Sea, an expansive ocean upon which areas of interest manifest as islands. While some of these islands house towns and main quests, it is nonetheless possible to complete the entire game without having charted a substantial amount of the Sea. Charting the entire Sea can be seen as one grand discovery sidequest, with constituent quests on each island discovered in the process. On uncharted islands of the Sea exist substantive, various adventures and secrets that round out the game both by adding more length, but also by giving the player a richer understanding of the game’s world. The endeavor to chart the entire Great Sea, while certainly time-intensive, does not feel like monotonous busywork precisely because the designers have made every part of the Sea unique, packed with novel challenges and exciting auxiliary quests. Discovery sidequests like charting the Great Sea differ from collection sidequests in two major ways: firstly, where collection sidequests typically focus on acquiring a massive amount of one item with minimal meaning, each coordinate of the Great Sea map contains a different sort of island, making the sidequest experience diverse and more representative of an odyssey than running errands; secondly, the objectives of collective sidequests do not inhere to the structure of the game’s world, whereas discovery sidequests like sailing the entire Sea directly concern deepening one’s knowledge of the game’s immediate universe. 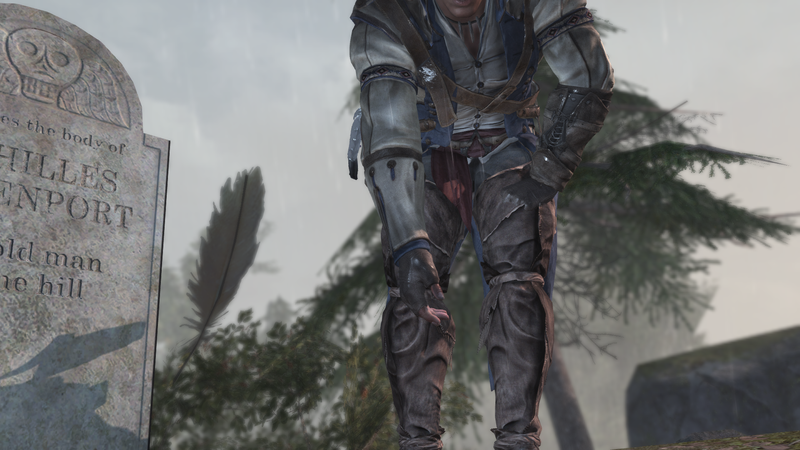 I believe that discovery sidequests are of particular value in the design of a masterful story-driven game because they establish a resolvable tension between the limited scope of the game’s universe necessary to solve the main problem of the game (i.e., main quests), and the comprehensive scope of its universe, as discoverable through sidequests. Yet in truth, I bring up discovery sidequests, and the premium which I place upon them, only to stipulate that the sidequests in “Majora’s Mask” go far beyond the merits of such quests. I have already begun to discuss the nihilistic metaphysics and ethical thesis of “Majora”; here, I wish to briefly survey why these two facts put the game in a unique position to have sidequests that are qualitatively more substantial than any other sidequests which I have seen thus far. When Satoru Iwata (Global President of Nintendo Company Ltd.) announced the coming release of “Majora’s Mask 3D,” he referred to the citizens of Termina as “a cast of endearing characters trapped in the final hours of their lives.” I alluded to a similar notion when I discussed the nature of Termina as a world that is eternally ending: its existence is described by a three-day time loop leading to the apocalypse. In one way, Termina is actually analogous to the Great Sea of “Wind Waker”: players of “Majora” have a framework for mapping the universe of Termina just as one can chart the Great Sea; the difference is that instead of sailing to different islands, players of “Majora” chart a course by easing the pain of virtually everyone in the world through a variety of entirely unique sidequests. The paths of the lives threatened by the moon essentially define the world of Termina, and it is this relation which allows us to derive special value from the sidequests of “Majora,” namely in the following three ways. 1. Each sidequest is a microcosm of the game’s macrocosmic framework of saving the world from annihilation. In the 23 quests leading to the acquisition of masks by Link, we see people who from the Dawn of the First Day are in exquisite pain that will not be resolved without Link’s help. The underlying theme of most of these quests is that the very foundation of peoples’ happiness is threatened, so that they will be spiritually destroyed if Link does not intervene. So in each of these sidequests, Link encounters a miniature model of his overarching quest: he must save the universe of a particular person or group of people from destruction before it is too late. 2. The game’s temporal loop prompts the player to directly engage in counterfactual analysis. Pick a sidequest to undertake, a specific person to save, and you can easily see the mission through to its completion. When the quest ends, you are typically presented with a mask, the symbol of your success in healing the concerned party. Yet when the player then plays the song of time and returns to the Dawn of the First Day to engage in other tasks, they quickly find that whatever person they just healed is now just as distraught as they were before the quest was undertaken — because, with the reversal of time, the course of the quest is also undone (the exception to this is in the case of characters who offer you masks by which you can transform into them, a matter which I will take up in at a later time). This game mechanic alone is worth dwelling on for a moment: thanks to the dynamics of time, the player is able to observe the citizens of Termina and see the courses that their lives take with and without Link’s intervention. This is a huge departure from traditional game dynamics, where non-player-characters (NPCs) with sidequests will typically exist as static entities, waiting for the player to approach them and undertake a linear sidequest; if the player fails, then the quest will probably either reset from the beginning because only success is “counted” in the game’s metaphysics, or else the quest will remain unavailable for the remainder of the current playthrough. The result of this dynamic in “Majora” is that the player is able to observe multiple potential outcomes of causal chains. Link can watch events fall apart as he does nothing; then, he can reverse time and see the joy caused by his intervention in those same events. Philosophically, one way of evaluating the causal structure of events is by imagining and comparing different possible worlds in which causal chains transpire with slight alterations; “Majora’s Mask” gives the player an opportunity to step into the thick of an active experiment in possible worlds. 3. The player is ultimately made to confront a choiceless choice. What is the result of this experiment in possible worlds? There exists no possible world such that everyone can be saved. By engaging the game’s sidequests, the player quickly discovers that different sidequests conflict by requiring you to undertake different courses of action at a single time in the three-day cycle, which means that it is not possible to complete every sidequest in a one three-day cycle. This means that no matter how hard Link tries, he cannot save everyone from defeat of spirit. Most poignant in this regard is the sidequest of reuniting star-crossed lovers Anju and Kafei: the length of the sidequest, which requires Link to takes actions over the course of all three days, consumes much of his time when it is undertaken, meaning he gives up many opportunities to help others in order to help a single couple. 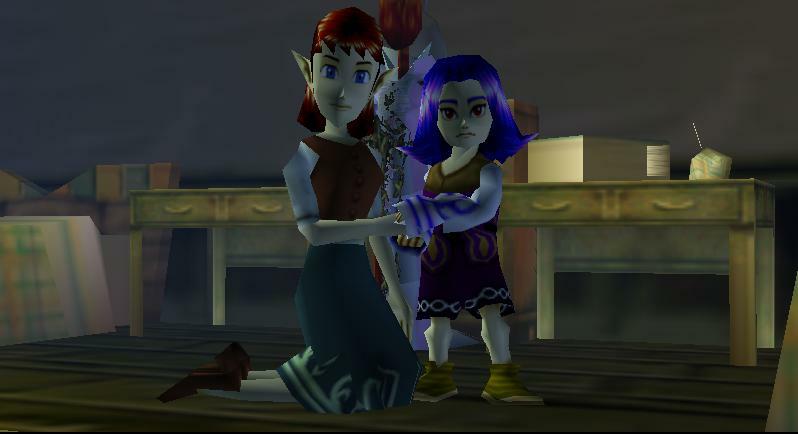 At the end of the quest, when Anju and Kafei marry, only minutes remain to potentially confront Skull Kid and stop the moon. 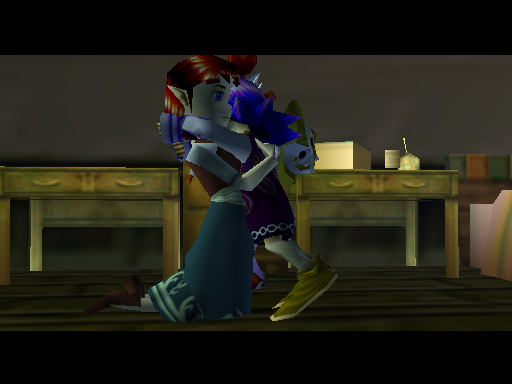 Moreover, to make an argument from game mechanics similar to the one we made with the Fierce Deity’s Mask, the function of the Couple’s Mask received from Anju and Kafei’s wedding is to cause Clock Town’s mayor to break up a meeting about the town’s Carnival; this cannot be done in the time remaining after the ceremony, implying that the player should reverse time at least once after reuniting the lovers. So, we might say that saving their love indirectly dooms Termina to oblivion in at least one three-day cycle. Of course, reversing time does not reverse everything about completing a sidequest: Link retains all the masks in his possession whenever he travels back to the Dawn of the First Day. Surely (and here I nod to “Ocarina of Time”), this must be significant as an emblem of having made someone happy, even if only in an alternate timeline? Yet as much as we want this to be the case, the endgame of collecting every mask, as I discussed in my last article, is the act of giving up all of those masks in exchange for the Fierce Deity’s Mask, the emblem of an evil god. I cannot conceive of a more eloquent way to eschew meaning from the universe than to force one to surrender all articles of the good-once-done, in order to save existence by playing the role of an evil god. We can note that one does not need to give away the masks one has accrued and acquire the Fierce Deity’s Mask in order to defeat Majora, yet the game’s design devalues this choice: the player’s collection of masks is glaringly incomplete without its final member. With the existence of a mask that denies morality any sense of objective truth, for one to deny the mask makes it seem as though one is hiding from the stark truth which the metaphysics of the game are thrusting upon one. Similarly, Link does regain all the other masks in addition to the Fierce Deity’s Mask if the player acquires the latter, defeats Majora, and then reopens the same save file; but of what value are these masks as articles of goodness when it was an article of evil that saved the world? The final result of the game’s counterfactual analysis is that not everyone can be saved; and indeed, insofar as Termina continues to exist as an apocalyptic world even after Majora is defeated, any instance of even one person being saved is entirely fleeting. Yet though the game may tell you at every turn that your actions are meaningless, it demands to be played. Like the structure of Hades’ punishment for Sisyphus, every new decaying causal chain Link learns about through sidequests and main quests cries out for him to save humanity, if only for one single moment. It is this picture of Link saving no one but making everyone happy that emanates from the universe of the sidequests of “Majora”; if any other game can effect this sort of meaning through the framework of auxiliary stories, I have yet to find it. Want to follow the analysis and theory? Read on at With a Terrible Fate.